Football Association of Malawi (FAM) has said the Egyptian Football Association will meet all the costs for the March 8 Under-23 friendly encounter against Egypt in Cairo. The match will be used to tune up for the joint 2020 Tokyo Olympic Games and Under-23 Africa Cup of Nations (Afcon) qualifying matches against Zambia. Nyamilandu added that Malawi will proceed to Belgium for camping in preparation for the games against Zambia which fall on March 20 and four days later. “In Belgium they will train for a week and play some strength testing matches before returning home to face Zambia,” he said. Nyamilandu hoped the friendly matches will help the team to improve defensively and offensively. “During our last game against Botswana, we had weaknesses in those key areas. While in Europe, the players will be coached by experts who will surely polish the team up,” he said. The FAM president was wary of Zambia, saying it consists of players that qualified for the 2017 Under-20 World Cup. “This is a strong team and we must prepare thoroughly if we are to beat them and proceed to the next round of the qualifiers,” Nyamilandu pointed out. 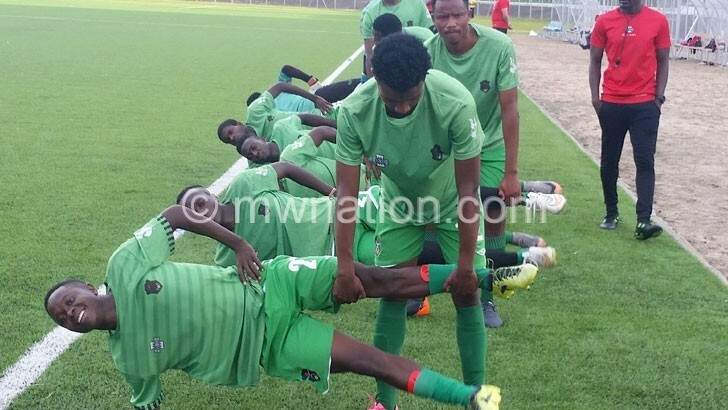 Meanwhile, Under-23 national team coach Meke Mwase said during Tuesday training session at Kamuzu Stadium in Blantyre that they will focus much on the scoring aspect of the game ahead of the Afcon qualifier. “In our previous qualifiers, we struggled to score goals and we cannot progress to the next stage if we do not rectify this problem before we face Zambia. “This is why we have decided to work more on polishing our striking prowess in all our training sessions,” he said. The Under-23 overcame e-Swatini 3-2 on aggregate after winning 2-1 away and drawing one-all at home.